We've learned this election cycle that casino magnate Sheldon Adelson isn't afraid to throw around vast sums of money to get what he wants -- he and his family have given at least $11 million to help the Newt Gingrich campaign. It hasn't gotten any notice since Adelson became a player in presidential politics, but it turns out that the trove of diplomatic cables published by WikiLeaks contains an interesting anecdote about how Adelson aggressively promoted his casino and hotel business in the Chinese territory of Macau -- and a run-in he had with the central government in Beijing. First, some context. The news broke last March that Adelson's Las Vegas Sands Corp. is under federal investigation into whether it has complied with the Foreign Corrupt Practices Act. The act makes it illegal to bribe foreign officials to obtain business deals. Jacobs alleges, among other things, that Adelson wanted him to conduct secret investigations of the dealings of the Macau government officials to dig up dirt so they could be intimidated, and that Adelson wanted the corporation to continue using the services of a Macau attorney with a bad reputation "despite concerns that [the individual's] retention posed serious risk under the criminal provisions of the United States code commonly known as the Foreign Corrupt Practices Act." 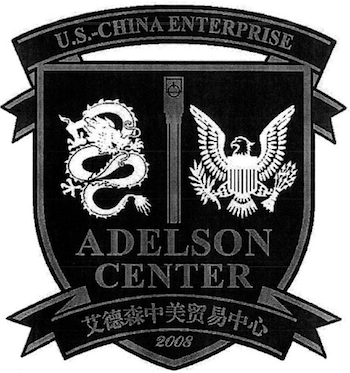 A confidential September 2009 cable sent from the U.S. consulate in Hong Kong back to Washington describes Adelson's business practices in Macau. Unlike its competitor Wynn, Adelson's Sands was lobbying Chinese government officials in Beijing rather than focusing exclusively on local officials in Macau, according to the cable. The issues of concern to Sands included "foreign labor visas, gaming oversight and regulation, infrastructure development, and perceived interference in personnel management decisions affecting Macau resident workers." The cable goes on to describe Adelson's personal interest in direct engagement with Beijing and the intriguing matter of the "Adelson Center for U.S.-China Enterprise" in Beijing, a nonprofit that was to be financed with a whopping $100 million. A former Sands executive told an unnamed American official that the Chinese government forced Sands to close the center following government inquiries about "funds transfer mechanisms used by [Sands] to establish the now-closed USD 100 million Adelson Center." The nature of those mechanisms is not specified. The cable continues that Sands' "current efforts in Beijing are designed in part to offset these early 'missteps'" -- but there is no elaboration on what the "missteps" were. Sands did not immediately respond to a request for comment. In early August , during the Olympic Games, Las Vegas Sands will launch the Adelson Center for U.S.-China Enterprise, in Beijing, which seems positioned to wield substantial influence. If you were an American businessman coming to China, the Sands's Bill Weidner testified at the Suen trial, "you might need a logistics partner to deliver your goods. You might need a manufacturer to manufacture your goods. You might need a law firm. You might need an accounting firm. Whatever it would take to get you involved in business in China, we would-the center would help arrange for you." Below is the relevant section of the cable. Another interesting moment comes further down in the cable when Sands executive Jacobs (who later sued the company) is quoted as saying that a new regulation about how much Macau casino junket operators could be paid "will be routinely violated." LVS [Las Vegas Sands] Macau President and CEO Steve Jacobs told EP Chief on September 17 that LVS restarted its government outreach efforts in Beijing over the past several months, and achieved "great success" in building direct relationships with senior officials. Jacobs said LVS's direct engagement in Beijing is designed to build goodwill, explain the company's current and planned contributions to Macau's economy and society, and encourage freer movement of PRC residents into Macau. LVS CEO and majority shareholder Sheldon Adelson highly values direct engagement in Beijing, according to Jacobs, especially given the impact of Beijing's visa policies on the company's growing mass market operations in Macau. LVS's pre-Olympic outreach efforts were suspended in early 2009, after the PRC forced the company to close its newly established non-profit Adelson Center for U.S.-China Enterprise in Beijing. The PRC's State Administration of Foreign Exchange in China, according to LVS's latest quarterly report published in August 2009, "made inquiries and requested and obtained documents relating to certain payments made by the company's wholly foreign-owned enterprises to counterparties and other vendors in China." A former LVS senior executive told Econoff that the PRC inquiries relate primarily to funds transfer mechanisms used by LVS to establish the now-closed USD 100 million Adelson Center. LVS's current efforts in Beijing are designed in part to offset these early "missteps."